We have excellent Vizslas that are an active and loving part of our family! We're excited for you to join the family. Sweetie and Cliff's pups were born on March 23rd. We are pleased to have these 3 boys enter our world! The reservation list is growing. If you'd like to reserve your spot, let us know. If you'd like to be notified of future litters, please contact us to be put on a list of people who are interested in a puppy from us but not quite ready for a puppy yet. $2,250 - Full AKC registration with online training video library access. We appreciate the great trust people have placed in us. We look forward to including you into our "extended" family wherever you may be. Click on this Follow the Litter Link for more details on the progress of this litter. Upon application approval, we will have you sign the contract and do a $100 deposit to hold your spot. Deposits are refundable if we can't meet your gender request, but are otherwise non-refundable. You will get to pick a puppy in the order that deposits were received. Full registration buyers will pick first in the order those deposits came in. Then Limited registration buyers will pick in the order those deposits were received. Puppy (and any other charges such as extended boarding etc. if applicable) must be paid for in full 24 hours before the puppy is picked up/shipped. It's easy to do if you're new to PayPal. PayPal lets you use your credit, debit or bank account to handle your invoices. We can help you with this if you haven't done PayPal. It's really very simple. The training is comprised of online videos that allow you to train your puppy using step by step instructions during each stage of your puppies development. 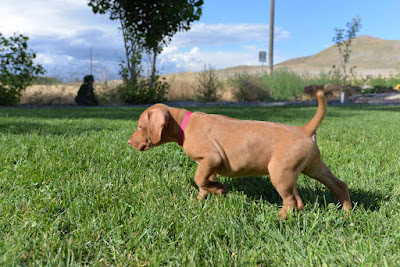 There are many training techniques and philosophies and our program has been tailored to the unique characteristics of the Vizsla temperament. Training can also be purchased separately for $400 if you have purchased a puppy from another breeder and would like to use a proven system of training. Ahhh.....Puppies are always So cute! Be sure to scroll down to see why you should consider one of our puppies. - We never over breed. A dog "can" have more than one litter a year but that doesn't mean it's healthy for them. So, we don't do that. - We have passed all the health screenings we have done, like the OFA hip and elbow test. We have also screened for and are clear of Brucellosis.